Arguably, one of the big challenges when it comes to the subject of diversity and inclusion, is that men often think D&I doesn't affect them positively or paint them in a good light. The reality is that D&I is about everyone. It's about creating a culture where people can bring more of themselves to work. So, why is the topic of D&I often perceived by men as an attack on their personhood when they, themselves, are at the intersection of many marginalized groups? 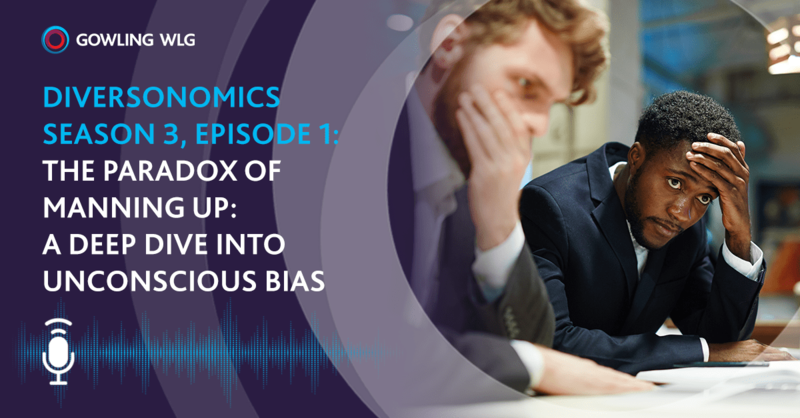 Tune into the first episode of Diversonomics, Season 3, as our host Sarah Willis sits down with former NFL player turned inclusion consultant, Wade Davis, to get some answers. Sarah: This is Season 3 of Diversonomics. The podcast about diversity and inclusion from Gowling WLG. I'm your host today, Sarah, and I practice in litigation in the Ottawa office. Today is a huge day on the podcast. We have a very special guest with us, Wade Davis. Wade is a thought leader, public speaker and consultant on gender, race and orientation equality. He's also a former NFL player and is the NFL's first LGBT inclusion consultant. He advises numerous professional sports leagues on issues at the intersection of sexism, racism and homophobia. This work includes creating league wide inclusive leadership strategies and organizing inclusion training sessions for coaches and players. Wade also consults on D&I for Google and advises various Fortune 500 companies on creating inclusive corporate cultures. He is a United Nations Women Global Champion for Innovation and built an extensive program to engage, educate and help men understand what actions to take towards gender equality. The topic of his first TED talk was The Mask of Masculinity. Welcome to the show Wade. Wade: Thank you for having me on. I always get so nervous and uncomfortable if someone's reading my bio. Sarah: Are there any inaccuracies you need to correct? I get nervous when I read someone else's bio in front of them. Wade: No. You're 100% accurate. It just makes me feel so uncomfortable. So, no, you know, there's a part of me that's really proud of my accomplishments but to hear them read back, it's just, I don't know. Like nails on a chalk board almost. Sarah: Well, you have had some amazing accomplishments and we're so happy to have you here on the podcast today. I'd like to start off with, if it's okay with you, with some of your story. How did diversity and inclusion become important to you? Wade: I would say there's probably two main incidences. First one was when I was hired as the assistant director of work readiness and current development for an organization called the Hetrick-Martin Institute. It's also the home of the Harvey Milk High School. At night, at the organization, there was someone called the Admin on Call, or the Admin in Charge, and I was often that person. Though I would be "in charge" I was oftentimes the most experienced person there. A lot of the individual staff who were below me felt that. So there was a little bit of apprehension and animosity with me being the leader. I had given this one young woman a directive and she didn't like my choice of thing that I told her to do. She told me no, for lack of a better word of language. We had a conversation. It became a little bit combative and I was trying to de-escalate the situation and I referred to her as "sweetie". She looked at me and she said, "Don't ever call me sweetie." In my really uneducated mind I thought the term sweetie was a compliment and I was trying to use that term to de-escalate her. So lo and behold, my supervisor, a woman named Lillian Rivera who's now a mentor, and she gave me a book to read. I had to end up reading the book three times because the first two times I didn't really understand what she was trying to get me to receive from the book. The book was by a great feminist named Bell Hooks and the book is called Feminist Theory: From Margin to Center. After the third time I read it I realized that the book was about me. One of the themes that I gleaned from it, not explicitly, but that I would have never called a male "sweetie". I would've never referred to him in a way to de-escalate the situation. It was really the first time I really had to start interrogating the way that I showed up as a man and to interrogate my unconscious biases around women and the way that I wanted to lead them. The other one was when I started to realize, because I was doing a lot of work in the LGBTQ sports space with the NFL, the NHL, the CFL, and MLS and as I read more, as I studied more, and as I started to have more conversations I realized that the root of homophobia was sexism. If I was going to do the work to root homophobia in sports spaces, and just corporate spaces at large, I was going to have to go to the root. The root was sexism and misogyny. Those were really the two moments that really started to, one, just make me as an individual interrogate how I was moving about the world but then also started pushing me in the different direction towards diversity and inclusion on a more larger scale than on an narrow LGBT scale. Sarah: That's fantastic. It's funny how there's certain points in your life, or certain circumstances, or things that happen that really make you take stock of how you've been acting or words that you've used in certain circumstances. It's really great that you had that self-insight to be able to see it and that it also inspired you to do more broader work and to really contribute to the diversity inclusion sphere. Wade: I just wish I got it the second time I read the book. Sarah: Fair enough. You know what? Sometimes it takes a couple of times to get it pounded into your head. Sarah: So, you came to visit us at Gowling WLG in Ottawa, I think it was 2 or 3 weeks ago now. It was recently and your talk was fantastic. I attended. I thought it was very inspiring and motivating in terms of creating inclusive space within our organization. I'm wondering if you can just give us a little bit of a rundown about what you talked about for our listeners who weren't there. Wade: Oh wow. I think I can maybe remember. I would say that the larger piece of the conversation was how diversity and inclusion and creating an inclusive culture benefits everyone. One of the biggest challenges I think that we have in the diversity and inclusion space is that men, specifically, don't often think that diversity and inclusion impacts them in positive ways. Part of my responsibility as a D&I consultant is to make sure that folks realize that diversity and inclusion is about everyone. It's not just about women, folks of colour, folks who are differently able, folks who are LGBT, but it is about creating a culture where folks can bring more of themselves to work. Which adds to different levels of creativity, of innovation, it helps to build stronger relationships. It allows us to have more candid, in-depth conversation so that all of us learn that each one of us inside of an organization has an important skill set that adds to the fabric of making an organization successful. We talked about moving from doing unconscious bias training to conscious inclusion training because so many organizations are doing unconscious bias training which I think is really important but one of the challenges is that, okay, after you gotten unconscious bias training, what's the next step? So how do you move from unconscious bias to conscious inclusion? How do you give leaders tools, tactics, almost like a tool kit, so that they learn how to flex their leadership style to meet the needs of all of their employees. How do you give folks the resources so that they understand that they have an unconscious bias but they know how to act moving forward now that they realize that they actually had these biases? How do you also start to intentionally engage men? How do you create spaces where men feel like that the issue of diversity and inclusion isn't an attach to their personhood but it involves them? Sarah: Actually, on that line of thinking, what can men do to be allies in diversity and inclusion? What advice would you give to our male listeners out there? On a bit more of a practical or individual scale? Wade: I would say that there's a couple of things that I typically ask men to do. One, is to own your stuff. Own the fact that there is a high likelihood that your friendship group, that all of the stuff that you're reading, is about men. That is specific to men, to something that you are deeply passionate about. How can you, one, own that and then say, "Alright, knowing that I have historically thought about the world in one way, how can I start to educate myself about the experience of the other?" The experience of women. The experience of folks of colour. The experience of differently abled. That is not that you are doing this to make yourself feel bad about yourself but if you desire to be a better leader, if you desire to grow as an individual, you have to be intentional to learn about the experience of the others so that you don't live in stereotype and then your own bias. So that's the first thing I tell men. Is to own the fact that you have an opportunity to grow in different spaces. Then to go out and read. To really spend time reading books about experiences of people who you don't have. I just finished reading this book by this wonderful writer, Roxane Gay. The book is called Hunger. The book talks about how when she was a young girl she had a really traumatic incident happen to her. Throughout her life she got up to about 577 pounds. It was the first time that I read a book that really wrestled with what it meant to be differently bodied in the world. She just shared so many visible examples. Like one, specifically, is like when she would get on an airplane and she'd be walking down the aisle people would look at her and then they would quickly look away with the hope that she wasn't going to be sitting by them. When I realized, in that moment, that that's things that I've done. Just reading that book, understanding the experiences of another, you become much more conscious in your actions. After you have owned the fact that you an opportunity to grow, that you read about, then secondly, how do you start putting your spaces in conversation with other people? How do you start talk to women? How do you start to talk to folks who are different from you, to start to ask really smart questions? So that you can start to analyze how are you being an unintentional exclusive leader. An example I give men often is your Fantasy Football league. If you're in a Fantasy Football league with folks at work you have created an unintentional informal mentoring system. Where you will now build relationships with other men in your organization so when it's time to make a promotion, or its time to make a hire, you're going to choose people who you typically know well, who you have a relationship with. So how can men start to analyze ways that they have unintentionally and indirectly created an informal mentory system? Then how do you start to write down all of the ways that you want to be a better leader? Write them down. Make them public. Make them visible. Then tell folks to hold you accountable. What would it look like, within your team or within your actual function, say, "Here are three tangible actions that I want to take to become a more inclusive leader. I'm going to put this out for the entire organization to see and I want folks to check in with me every 3 months, every 6 months, every 12 months, every 9 months, to ensure that I am sticking to the promises that I have made. There's some real tangible ways that I think we, as men, can be better leaders. Sarah: It's interesting you talk about the informal mentoring system. I think in larger organizations, especially, you will have formal mentoring and formal processes in place. I know Gowling has this. But you do develop informal mentoring relationships, that often end up being more important and more significant, to you personally and for your career development. It's interesting that you talk about the example of the Fantasy Football league because it's actually not something I'd really considered before about how things that seem social in a work setting do play into the overall work environment in terms of people feeling included, career development and sort of developing relationships within a company. That's a very interesting point. It's not to say that a Fantasy Football league can't happen but just being aware of the impact of having that and maybe not other opportunities for informal mentoring among colleagues or individuals who are working under you. I think that's a really, really good point. Wade: Those informal kind of social systems are the things that you typically enjoy a little more. They're attached to your own personal passion. Everyone gets excited to mentor another person but then still work. If you have a Thursday night where you go out and play pool with your friends, you're actually building a relationship outside of work so you now have multiple ways of actually viewing a person and you get to know the crust of a person. If I've spent the last 12 weeks playing Fantasy Football with Tom, with Carl and with Patrick, and they're on my team or they're just in the organization, and now these three men along with these, probably four other people, are up for promotion. I have a better understanding of who Carl, Patrick and Tom is than these other four individuals. I'm much more likely to be able to advocate for them differently and speak to them on a professional level and on a personal level. Unfortunately those create biases because you actually want to interact and work with these people more because you enjoy your time with them. People have to understand that there's some serious impact to how people are promoting and hiring in organizations based on our professional and our personal relationships with them. Sarah: Yeah. That's a very good point. I think it's definitely something I'll take away from the podcast today in terms of how I interact, socially, with individuals that I work with and how I can create more opportunities to have more people involved, or at least recognizing the impact that that has in terms of decisions I'm making. Wade: It goes back to the point that the point of unconscious bias training is to make you aware that you have biases but you want to become much more conscious of the ways that you are an exclusive leader or that you're creating these informal mentoring systems. How do you actually give people tools? How do you actually help them understand and write down what are the ways that I make exclusive leader? Or the ways that I've created these informal mentoring systems so that yes, I know I have a bias, but there's some tangible things that I'm doing on a day to day basis that's also exclusionary. Sarah: Right. It's very insightful. From a more macro level, I guess, there are a lot of individuals listening to this podcast who are working for organizations, both big and small, what would be your advice to organizations who want to create a more inclusive culture and really want to promote diversity and inclusion? I know that's a pretty big request but even some general tips. Wade: I would say, one, that people have to make sure that their diversity and inclusion initiatives aren't marginalized. Or aren't fitting over in the department of HR or are separate from their larger organizational strategy. My colleague, Tony … Harris always says that diversity and inclusion is a marginalized agenda for marginalized people with marginalized budget. If that is the case in your organization you're never actually going to have any transformational change. How do you make sure your diversity and inclusion agenda is aligned and embedded in every strategic initiative that you have in your organization? That it is not sitting separately. If it's sitting separately then it is just a transaction. It's not going to be transformational. If you're senior leaders haven't been coached, haven't been educated to be able to clearly articulate why diversity and inclusion matters to them as an individual, but how it also matters to the life blood of your organization, then your senior leaders will never actually make the rest of the people in your organization believe that they actually really care about it. It's very easy for you to give your CEO, your CFO, your COO, or anyone in the seat, your talking point. But you can tell if someone truly believes in this actual issue by just asking a couple deeper questions. So how can you make sure that senior leaders are educated about this issue and it's personal to them. Not something that they want to hear about the data but in it's something that's deeply personal to them that they understand that this is not just a moral issue, it's a legal issue, but it literally will sustain your organization going forward. If they don't understand that at a root level then it's never going to stick. Also, organizations have to really do audits and diagnostics to understand where their … Most organizations do a decent job at hiring diversity at lower levels but most organizations don't know where are your challenges? Where are your areas for growth? Is it in retention? Is it in your employee resilience? Where in your organization are the individual challenges that you need to pay some more time to? I would say the other thing is how do you get employees to reimagine what potential, what talent looks like? If everyone thinks the talent is only located in the Ivy League schools or the Stanford's of the world or these known institutions that are thought of as being kind of the places where knowledge is produced, then you're missing out on an entire crop of individuals who may choose to not go to those schools, who could have but chose not to for a lot of different reasons. How do we start to reimagine what intelligence is? How do we start to reimagine what potential is? I think that those are some small things, but on a macro level, those are some really tangible things that leaders have to be really intentional about doing. Then how do you actually start to coach your leaders on how to be an inclusive leader? It's not natural for most people to be intentionally inclusive. We like to hang around the same type of people. You want to hang out with people who like the same things you like, or went to the same school that you attended, that are in the same type of social economic class. That is how most people like to situate their lives. Most of us need to actually taught how do I become an inclusive leader. If you're interested in coaching your leaders on how to do x, y, z better they also need to be coached on how do I be a better inclusive leader. What are the skills I need to learn and to develop in order for, as an organization, as your bringing in all of this new diverse talent, your leaders have to be able to lead these actual people. Most people don't. If you go out and hire the best and brightest woman from a different part of the world, that leader who is leading her, actually needs to know how I do ask really smart questions to find out what does this person need who may be different from the person who went to the same school in Canada who I went to as that senior leader. Sarah: That's a very good point and I think it's something that our listeners can take away in terms of how they can make changes to their organization and start having those conversations. We do also have a lot a law students who listen to this podcast. I'm wondering, as law students coming out of school and maybe starting in on their first law job in a larger law firm, or smaller law firm, do you have any tips for them on how they can promote diversity and inclusion? Wade: For younger people, and I use that not in a pejorative sense, if you're a young person you have an opportunity to make sure that the organizations that you choose to work for stand for creating an inclusive culture. That those are the questions that you're asking an employer, as you go into an interview session, that one of the questions that you ask is how do you as an organization create an inclusive culture? How do you make sure that when you're starting in an organization, that during your onboarding process, that the company, whatever they said during the interview process modeled that and sticks to that as you're being educated about what your actual job function is. Then how do you as an individual become an intentional that when you're joining the actual firm that you are not following the same path that you historically have been by hanging around the same type of people. How do you, as an individual, put places or measures in place to have other people hold you accountable. So that you're not meeting with the same type of folks every day. As a young person, as you're trying to learn different parts of the organization so that you can grow and be successful, you should also prioritize diversity in your friendship groups. In your social networks. All of those things are ways that you, as an individual, can start to make sure that as you grow as a professional, you're growing also in making sure that you're flexing your ability to interact and engage with different types of people from different backgrounds. Sarah: That's great advice. Thank you. Okay, I think we're just about out of time now. Thank you so much for being here with us today, Wade. It was such a pleasure to have you on the show. For our listeners, if you ever have any questions, comments or ideas for topics and guests please look us up at gowlingwlg.com and get in touch with us. We'd love to hear from you. Also make sure to check out the show notes at diversonomics.com. Last, but not least, make sure to subscribe on iTunes so you don't ever miss an episode. And while you're at it leave us a review to let us know what you think. Diversonomics is presented to you by Gowling WLG. This podcast will count for up to 23 minutes of Equality & Inclusion Professionalism (EDI) credit toward the mandatory CPD requirements of the Law Society of Ontario (subject to the overall limit of 6 hours per year for viewing archived video programs). Sarah Willis is an associate in Gowling WLG's Ottawa office, practising in the areas of commercial and civil litigation, and medical defence law. To learn more about Sarah connect with her on LinkedIn.